As much as I love Amsterdam city life, one of the things I value most is how easy it is to escape – and to escape by bike. I’m on a constant quest to find the perfect mix of city and nature, preferably in close proximity. After all, I’m a Seattle girl, and value easy access to both city and nature in close proximity. I believe the best cities are simultaneously rugged and sophisticated, with the chance to don hiking boots and high heels – preferably on the same day. Admittedly, Amsterdam lacks mountains and (in this rather urbanized country) wild nature. Nonetheless, I’m constantly amazed by the availability of green spaces in the city or in close proximity. 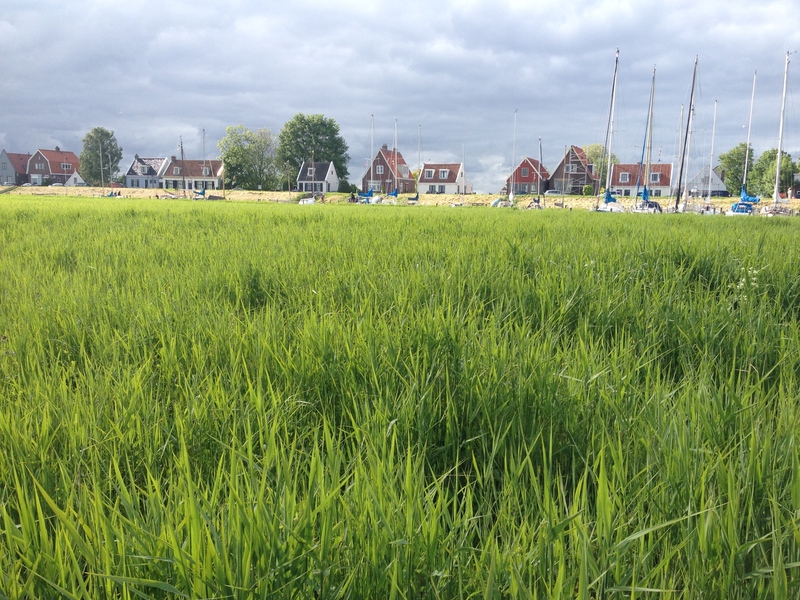 Since moving to Amsterdam, I’ve learned how to forage for wild herbs, volunteered in several urban agriculture gardens, and explored the forested landscape park, the Amsterdamse Bos. I’m happy that in 20 minutes (or less) I can completely transform the scenery with my own peddle power: cycling from the middle of the city, to the middle of a forest; from the canals of old town, to farms and villages surrounding the city… or a summer’s jump in a lake or the sea. I recently had a friend visiting and we decided to take advantage of the sunshine to explore some of Amsterdam’s lesser-known corners. 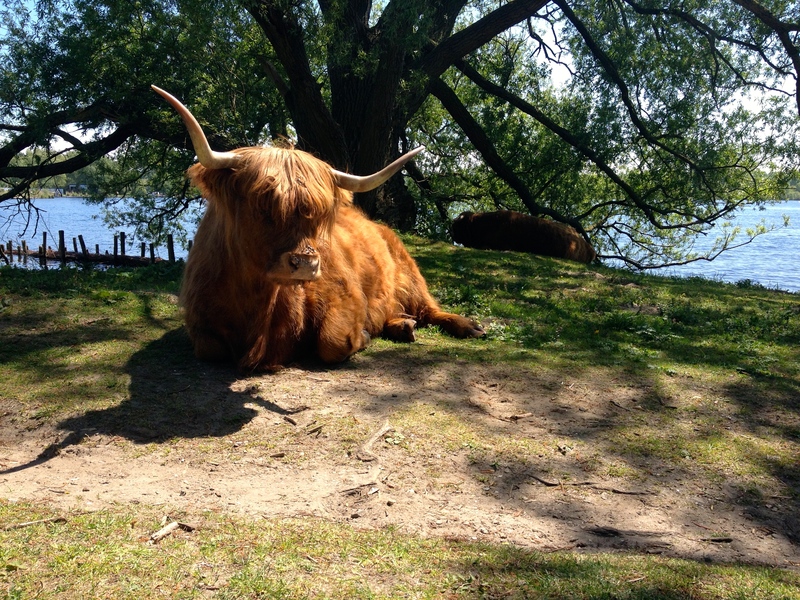 Heading south, we cycled past houseboats moored in Amsterdam’s southern canals, past garden houses, highland cattle (yes, highland cattle in Amsterdam) and blackberry vines, to the De Nieuwe Meer, a manmade lake that was dredged in the 1960s. Today this lake is a popular sailing and swimming spot. 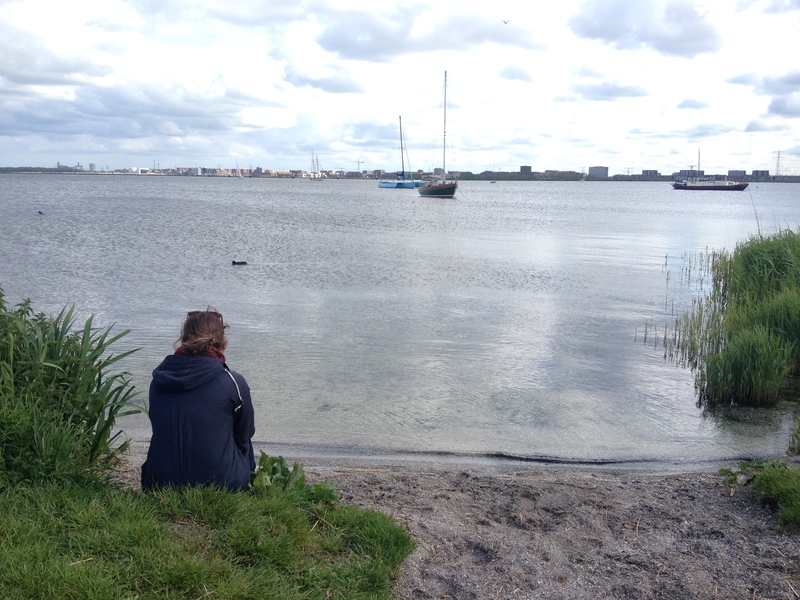 On one side of Nieuwe Meer is Schiphol Airport; on the other is Amsterdamse Bos. 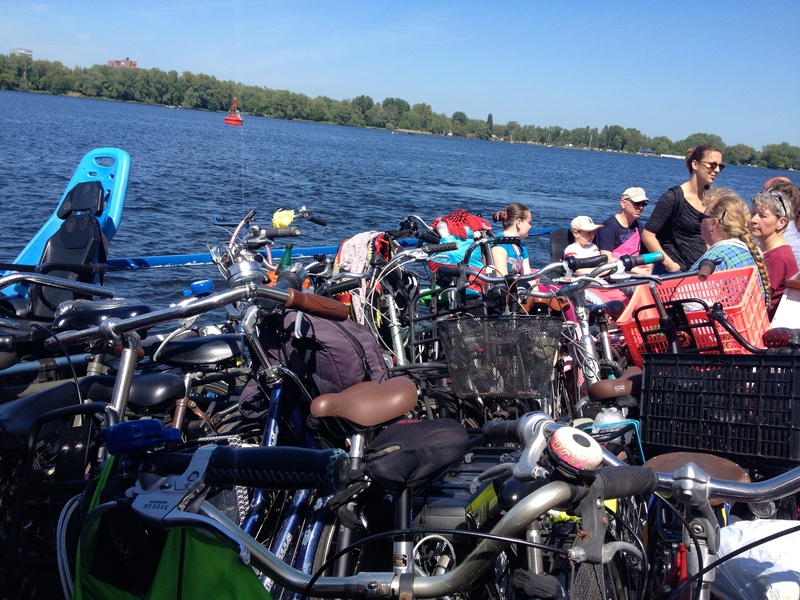 To cross the lake, we took a small ferry, large enough for 100 persons and roughly the same amount of bikes. And everyone had a bike. 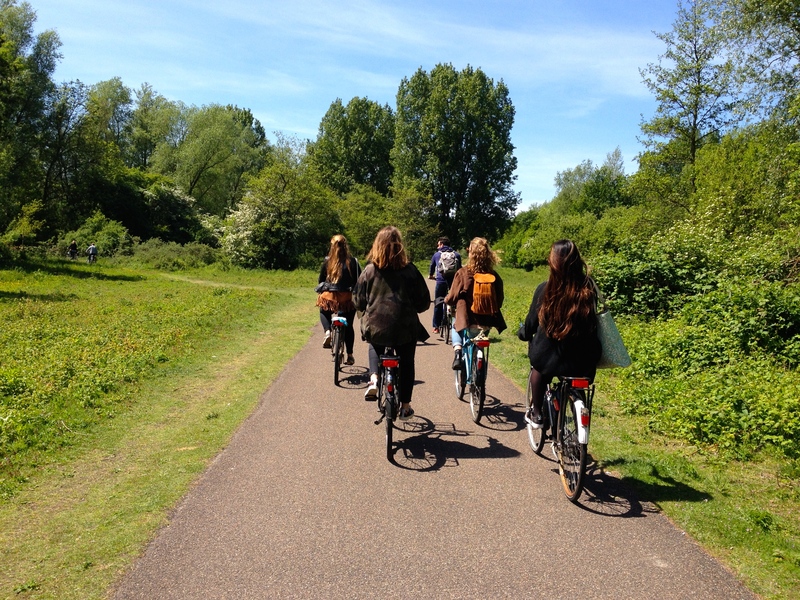 Crossing into the forest, we visited my beloved free-range biodynamic goat farm (Geitenboerderij) before cycling on through the forest to the Amstel River. 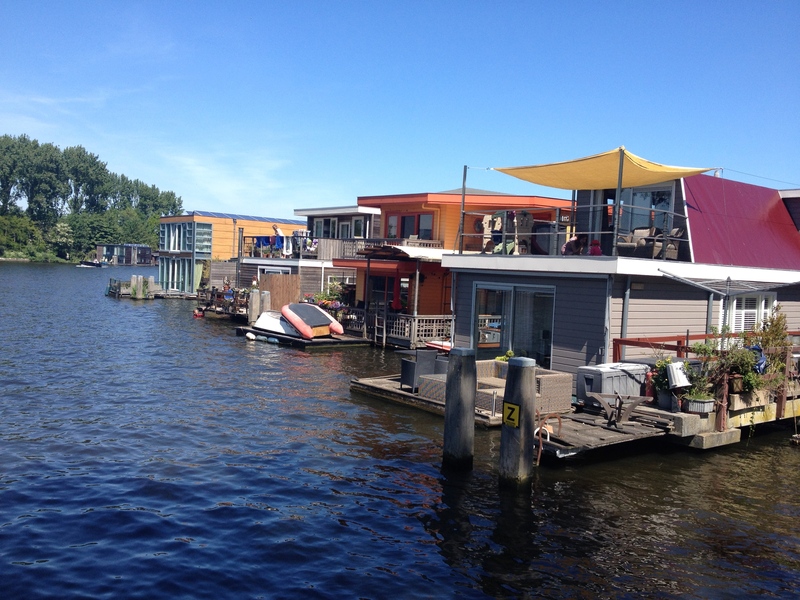 Cycling along the Amstel is one of my favorite routes, depicting the magic of Dutch planning. Old farmhouses stand peacefully, as they have for generations, unbeknownst of their positioning several meters below the Amstel River flowing constantly above, and protected from gravity by a series of ancient windmills, dykes and pumps which re-direct waterways, keeping low-lying farm houses dry. 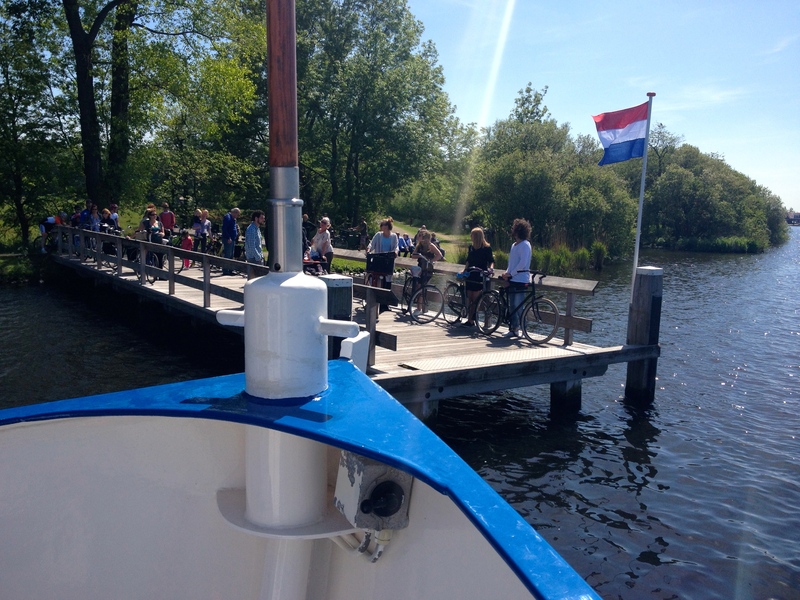 Speed cyclists and pleasure boats cruise by near or on the river above. Dutch topography, with its reference points concerning what is up and what is down (as usually dictated by gravity) is something that will never become normal for me. 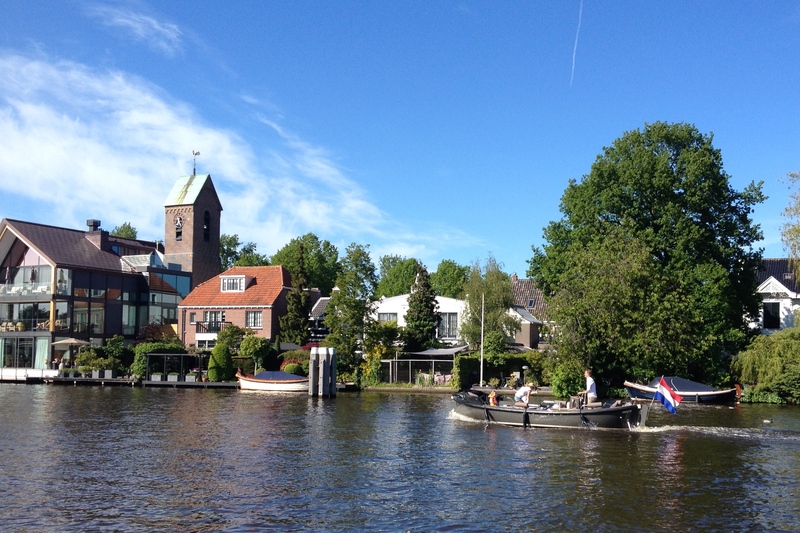 We stopped in the small town of Ouderkerk aan de Amstel, exploring by foot and enjoying the sunshine at a riverside café. 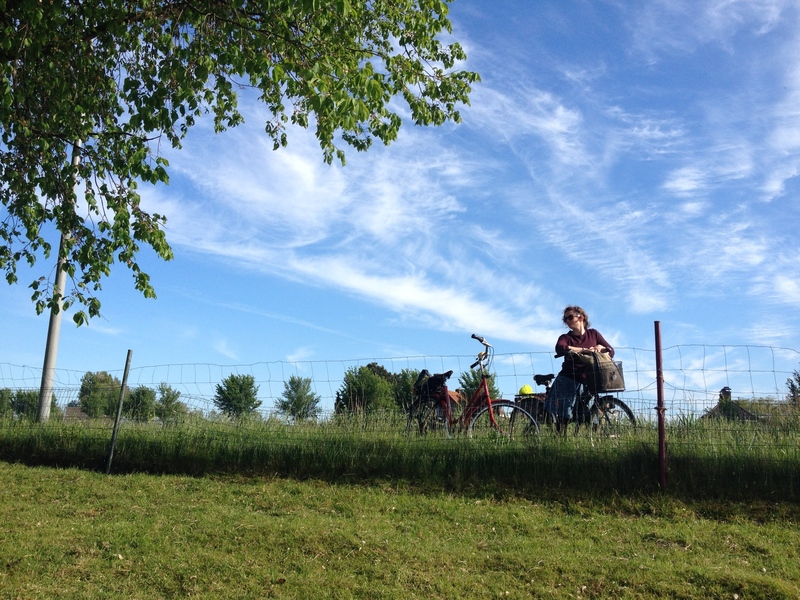 Cycling back towards Amsterdam, we passed several small farmhouses. Newborn sheep and their mothers cautiously eyed us, as I tried rather unsuccessfully to move in closer for a photo. But this simple, peaceful countryside scene is trumped, with a highway, skyscrapers and the Amsterdam football stadium (Bijlmer Arena) serving as a not-too-distant backdrop. This will also never become normal to me, no matter how long I live in the Netherlands. The feeling of how everything can seemingly (and effectively) coexist in such close proximity: the city and the countryside. And yet, despite this close proximity, each alludes to a feeling of just that. 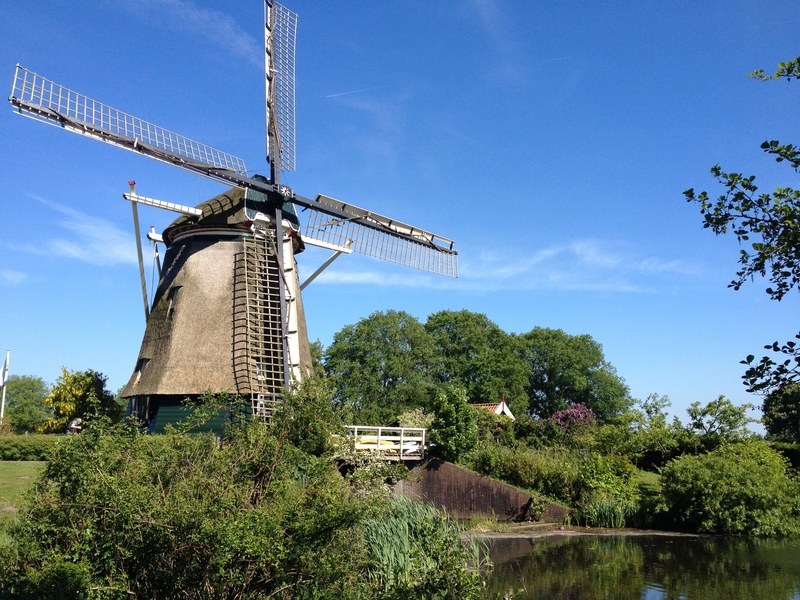 When we cycled by those farmhouses, I felt I was in the countryside, passing goats, chickens, windmills, apple trees and hay barrels. As we cycled back, it became clearly evident that we were again in the city. Amsterdam is easy to escape; and it’s easy to return – and best of all by bicycle. Indeed the perfect mix of the “good city, good nature” concept I so admire in a city. It was indeed! 🙂 A great weekend entirely!